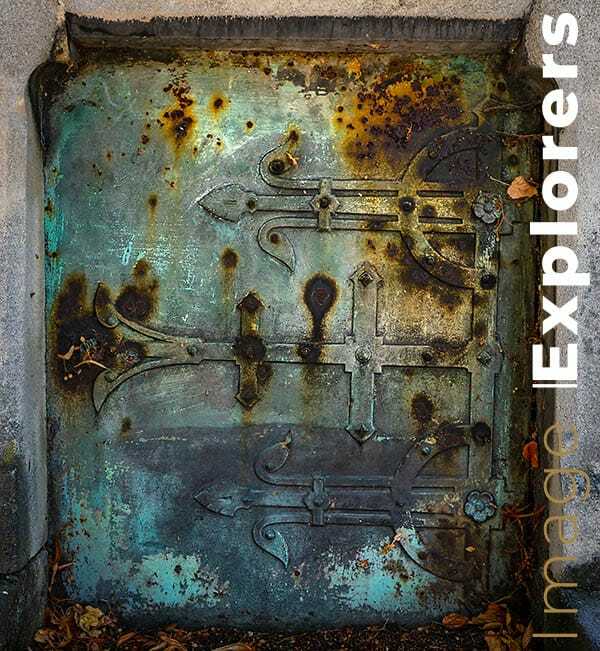 Now this conversation could only have been with a non-photographer, as most photographers are aware that graveyards, especially ornate and dilapidated ones, can produce some quite stunning and unusual images. 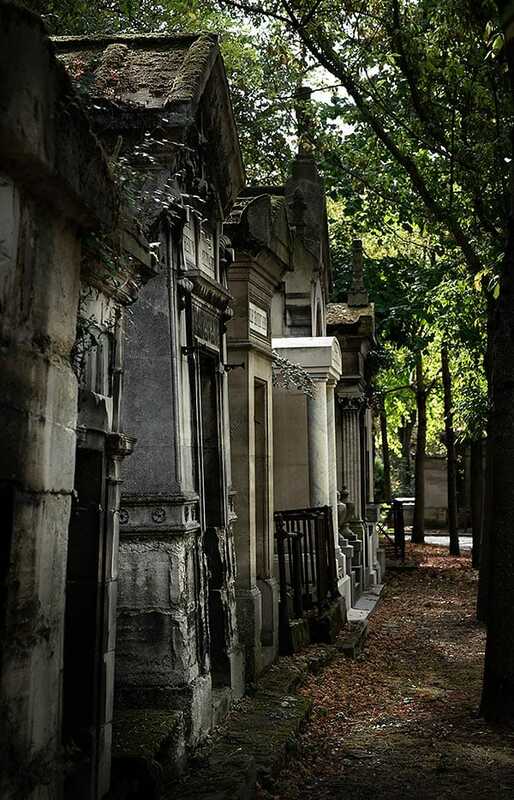 To photograph Paris graveyards was one of the highlights of our trip and we thoroughly recommend it to any photographer who needs more than the usual tourist images of Paris. Why the cemetery (Cimetière du Père Lachaise)? Let us tell you about it and we’ll try not to put in too many death puns. 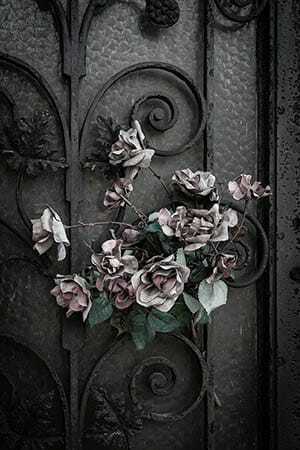 Although it doesn’t sound too inviting, a morning or afternoon spent wandering around the mausoleums, some well-kept and some dilapidated, is a very relaxed experience and not in the slightest bit morbid. The photographic opportunities abound with more beautiful textures than you can shake a bony old stick at. While out there look out for graves of Oscar Wilde, Chopin and Jim Morrison to name just a few. However, they are not as photo-worthy as the old and forgotten ones. Cimetière du Père Lachaise lies at the North East side of Paris about 3 km from the centre but is really easily accessible by car or the Metro. Père Lachaise (line no’s 2 and 3), Philippe Auguste and Alexandre Dumas (both on line no 2) and Gambetta (line no 3) all surround the cemetery. 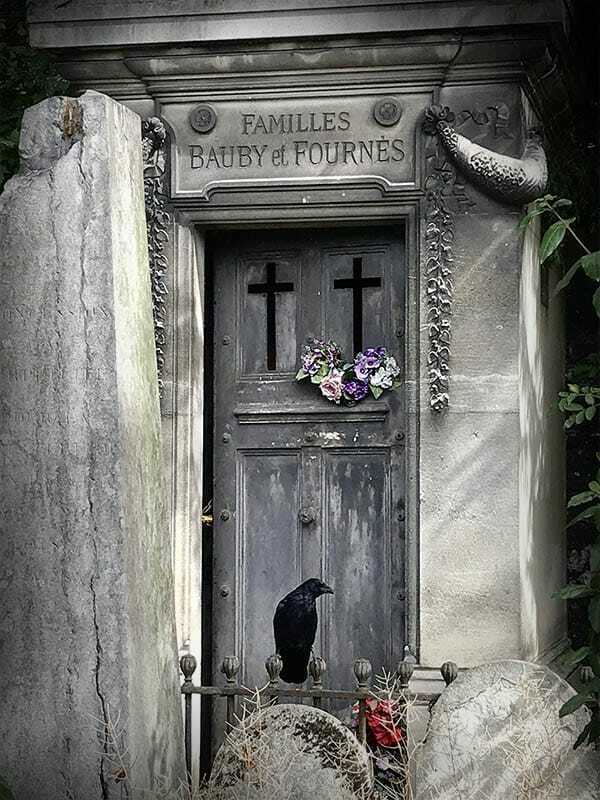 There are various entrances around the walled graveyard and depending on which one you use, you can usually find a map of the who’s who of Paris dead and where to find them. (Or you can download and print one before you go). When Ally first suggested we photograph Paris graveyards to me, I was really excited. How romantic – not! We started off for an early breakfast at an awesome café nearby called Chambelland Boulangerie. They do gluten-free bakery items and the continental breakfast we had was superb. We enjoyed it so much we even bought extra to eat after the cemetery photography. Turns out there is a lovely small wild park on the south side of Cimetière du Père Lachaise and we had our lunch there. Arriving at the graveyard we were totally taken aback at how gothic it felt. Don’t worry about offending people by having a camera out. Most people we saw were either making photographs or on a pilgrimage to see their favourite dead artist’s final resting place (and photograph themselves in front of it). Mini stained glass windows in mausoleums throw amazing light shapes on the stone. Trees growing through or around old graves can make interesting images. Try looking for contrasts like saturated colours in a bleak stone surround, or small delicate flowers blooming next to a rusting old façade. Textures. There are just so many awesome textures we couldn’t get enough. Black and white – Try some moody black and white versions of your images. Up the contrast but keep the shadow detail for a little macabre feel or a high key misty image for mystery. Toned – A duo or split tone can give a eerie feel if for example you mix blue shadows with yellow highlights to get a green; Cyanotype gives a cold feel and selenium or Sepia tone for an old vintage feel. 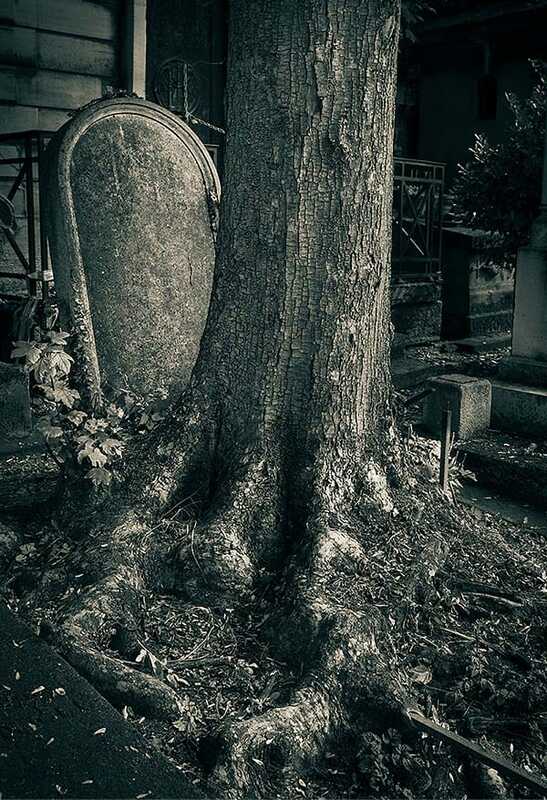 From well-tended to so old that a large tree has taken over the grave there are image opportunities aplenty when photographing Paris graveyards. Set aside a warm afternoon, take your favourite camera and lens and dig-in. (Sorry, I couldn’t help that one.) You’ll be glad you did.